Shoal Creek Golf Course – A Walk In The Park? 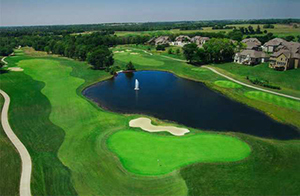 Shoal Creek Golf Course in the Northland is not only one of the best designs in the Kansas City region, but is also replete with flowers, tall prairie grasses and colorful shrubbery that add unusual beauty to a round of golf. It’s fitting that the course is owned by the Kansas City Missouri Department of Parks and Recreation, although managed privately by KemperSports. Shoal Creek opened in 2001 and quickly became recognized by Golf Digest and other publications as one of the best public courses in Missouri. Accolades include a number 2 ranking by Golfweek’s America’s Best You Can Play in the State of Missouri. 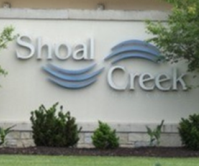 Shoal Creek head professional David Brouillette said there are multiple reasons for the high ranking. The par 71 Shoal Creek is plenty long – 6,983 from the back tees and 6,363 from the middle, with respective course ratings of 73.9 and 70.8. It has a brawny 139 slope rating from the back tees and 127 from the middle. The forward tees are more forgiving at 5,571 yards with a 66.5 course rating and 116 slope. From any tees, the opening holes post an early challenge into prevailing south winds with some uphill routes to the greens, according to Brouillette. “The first five holes are difficult, but once you get through those, you get your scoring holes of 6 through 16 and then hang on tight for 17 and 18,” he said. The 17th is considered the signature hole. It is a par 3 that forces a carry over Shoal Creek to a green fronted by a rock wall. That challenge is followed by the long 18th with a dogleg right and where par would be a good score. The hole measures 464 yards from the back tees. Shoal Creek also has plenty of sand, often along the fairways and within reach of the tee. But the course has wide, if not necessarily friendly, rough that help players recover from wayward tee shots. Shoal Creek was built in partial conjunction with housing developments, but most holes wander through woods and fields. “When you are out there it’s like you are on the hole by yourself. You are not running next to other holes,” Brouillette said. Shoal Creek is among only a handful of public courses in Kansas City with GPS systems on each cart. This system not only gives players yardage, but it also allows golfers to order food and beverages while on the 9th or 18th tee. Just punch in what you like, and its waiting for you after you tap in to finish the hole. 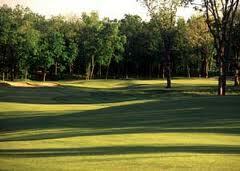 Shoal Creek has zoysia fairways and bent grass greens that are plenty speedy, with a true roll. Brouillette credits the consistently top condition of the course to Superintendent Duane Sander, who has had the job since the course opened. Shoal Creek’s green fees vary by time of day and day of the week, including winter rates that began on Nov. 1. Full memberships are available or players can get 10-round punch cards. 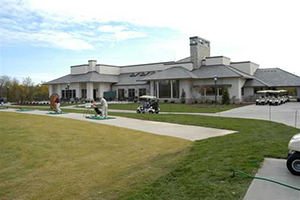 Club pros offer lessons, either on the practice tee or during a nine-hole round. Shoal Creek is in the Northland, but can be reached from most central areas of Kansas City in 15 to 20 minutes because the route is largely along highways. With a large clubhouse and banquet facility, Shoal Creek has become one of the premier banquet and reception facilities in the northland, Brouillette said. The course is located at 8905 N. Shoal Creek Parkway just north of Highway 152 between Interstates 435 and 35. The course website is www.ShoalCreekGolf.com.